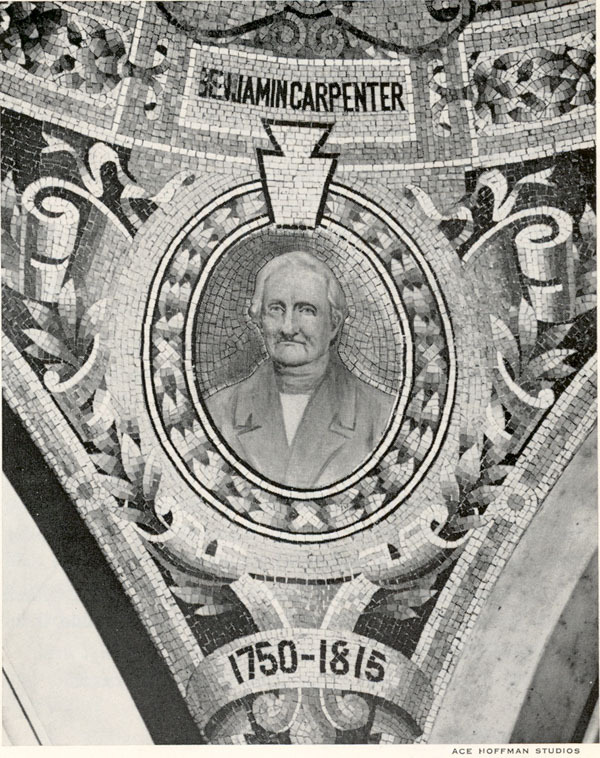 This mosiac is on the ceiling of the Courthouse in Wilkes-Barre, PA.
Benjamin Carpenter born Jan. 20, 1750 in Orange County, New York. During the American Revolution he served as a Lieutenant in 10th Regiment of Pennsylvania and was in Battle of Wyoming, July 3, 1778. What we know of his life has been documented by Ruth Truxall in From Then Till Now: Methodism in Sunbury, Ohio 1811-1964. It is not know exactly when Judge Benjamin Carpenter of Wilkes-Barre, Pennsylvania, came to Ohio. He may have been one of the original settlers who came through with Moses Byxbe. Benjamin purchased land north of future Sunbury in July 2,1806, signing a Mortgage Deed to Moses Byxbe (recorded in Deeds from Franklin, Ross and Fairfield Counties, page 320). This land was just north of Sunbury on St. Rt. 61. His house was west of the road and his barn on the east side. Circuit riders used his barn to hold services. The frame house at 1221 St. Rt. 61 was replaced by a brick house when Ray McDannald purchased the property. Art Culver, who owned the property in 1964 described the barn as a 40 x 30 foot structure with log rafters and pine siding, tongued and grooved. The historic barn burned in 1939. There is a stone marker to locate the place. Two of Benjamin’s brothers, who also settled in central Ohio, Gilbert and Samuel were still in Pennsylvania when Benjamin wrote this letter to his children in Ohio while he and his wife Polly visited their former homes in Luzerne County, PA, and Orange County, NY. “I am at a loss for words to express my solicitude for your happiness and the enjoyment of your company again and the rest of our friends and good neighbors in the state of Ohio. Believing that you will be pleased with hearing your Dadda and Mamma are well, it is a pleasure to us next to seeing you to tell you so -- We are well – and so are all our friends living here and in New York. “Our visit was unexpected especially in the state of New York. Figure to yourself how a people would feel should a bespectacled old friend rise again from the dead: No Business was done for 2 weeks: joy and feasting filled up each happy Day. . . . .
“I appoint no time when to be home but as soon as I can: do not delay any team work till my return You will try to hyer horses or oxen John Ousterhaut will not be there – he has bought of Justice Jones Doctor Skeel: John Wjitlock and a Doctor Whitney who married Betsay Dorance will be there early in the spring. His brother Gilbert Carpenter moved to Zoar – now Galena while Samuel Carpenter settled in what would become St. Albans Township (Alexandria) in Licking County, Ohio. All three men were devout Methodist and welcomed circuit riders onto their properties which eventually led to the formation of churches. Judge Benjamin Carpenter’s barn was on the Delaware circuit. Later the Galena circuit served this community until 1916 when they began sharing a minister with Berkshire Methodist Church. See more about this in the history of the Sunbury Methodist Church. Documents in the courthouse from 1809 show he was one of the Associate Judges of the Court of Common Pleas of Delaware County, Ohio. 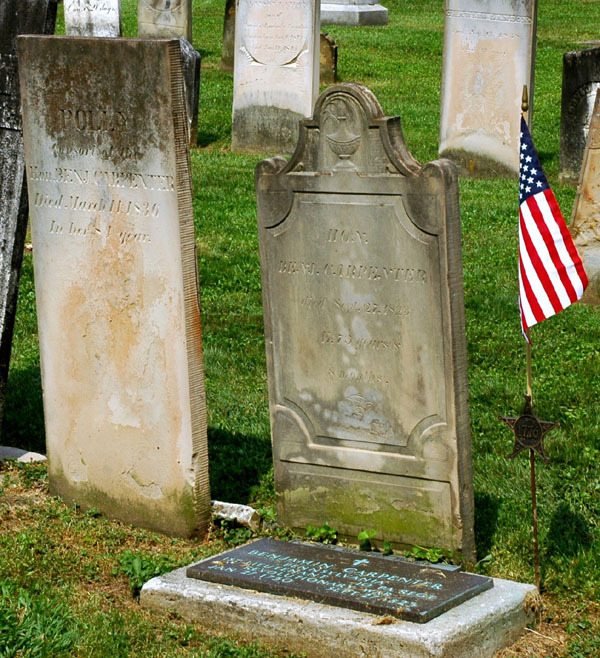 Benjamin and Polly Carpenter are buried in Galena Cemetery as is brother Gilbert and his wife.